Comments Off on Gartner – End to end customer insights’ achievable with Dynamics 365 CRM. 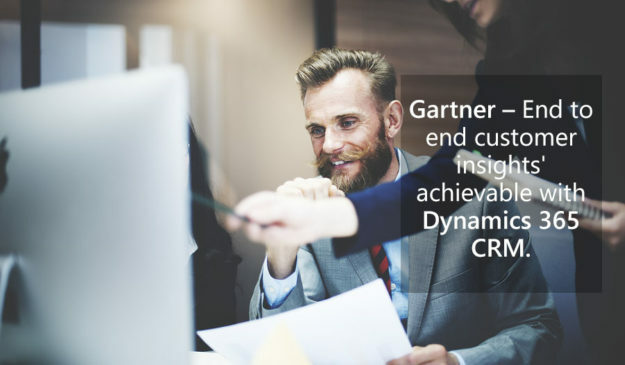 Gartner – End to end customer insights’ achievable with Dynamics 365 CRM. Business owners who are not using CRM software, or still relying on legacy programs to analyze their customer databases, may never see the value in software like Dynamics 365 CRM to discover opportunities to help increase revenues and profitability. To this end, Microsoft Dynamics 365, launched last July, is designed to deliver such actionable data to automate workflows while bringing meaningful metrics to the forefront; this, to assist sales and marketing to better understand the overall operational efficiencies(or inefficiencies); costs associated with all phases of marketing; salespeople revenue; sales cycle timelines, to name a few possible outcomes. In the service sector, too, Dynamics 365 will allow asset monitoring and “anomaly detection” as part of its inherent design in the digital realm of the Internet of Things (IoT). Contact us to learn more about the Dynamics product line, including Dynamics GP, Sl and Dynamics 365. Leverage our experience as a certified, Microsoft Gold Partner. Posted in ERP Software Information | Comments Off on Gartner – End to end customer insights’ achievable with Dynamics 365 CRM. Microsoft Dynamics 365: Ideal for ‘vertical’ markets. Microsoft Dynamics Cloud: Enhances patient care; HIPPA compliant. Professional Services Automation for Project-Centric Companies – Why Do I Need It?